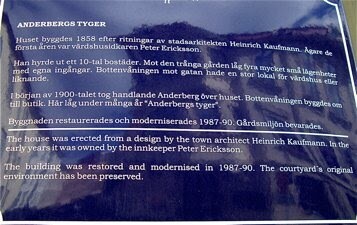 This beautiful house at Haga in Göteborg is called "Andersbergs Tyger" or "Anderberg's textiles." Here is a short story of this house. Anderbergs tyger is one of the most beautiful houses of the Haga district of Göteborg. A blue memorial plaque gives an account of the history of the house . It tells that the house was built in 1858 after a design by town architect Heinrich Kaufmann. The house was owned the first years by inn keeper Peter Ericksson. He rented out 10 small apartments in the back of the building facing the courtyard. Ground floor facing the street had a large quarter for an inn. 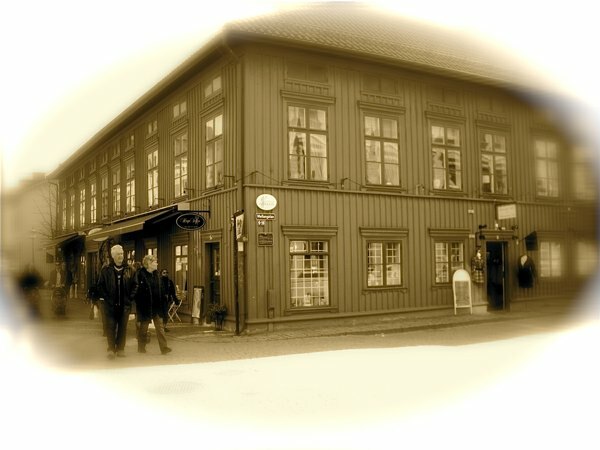 The house was taken over by textile merchant Anderberg in the first years of the 20th century, and the ground floor rooms were converted into a textile shop. The house was restored 1987-1990 and the original environment has been preserved.